Brandeis is hosting a two-week summer institute for graduate students in the mathematical sciences from July 27-August 7. 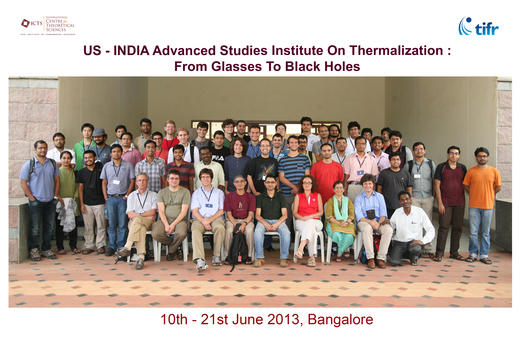 This will combine the annual summer institute of Brandeis’ Geometry and Dynamics IGERT program, with a sequel to the US-India Advanced Studies Institute on thermalization, held two years ago in Bangalore. There will be no registration fee, but the venue will have limited capacity, so interested students should register by sending an email to Catherine Broderick (cbroderi@brandeis.edu) by July 4. Please list your affiliation, your year in graduate school, any publications, and the name of your PhD advisor. Additional information can be found at www.brandeis.edu/igert/. and a schedule can be found at http://www.brandeis.edu/igert/calendar/index.html or in the Brandeis Science Seminars listings. We will be having lunch in the Volen bridge; please bring your own and join us! Textbook thermodynamics treats equilibrium states of large systems, in which macroscopic variables (temperature, pressure and so on) remain static, and how small perturbations of such systems relax with time. There have been a number of exciting recent developments in studying (a) how such equilibrium states are reached in a closed quantum or classical system, and (b) generalizations of thermodynamics to small systems and to systems that are intrinsically out of equilibrium. This work spans both classical and quantum mechanics, and ties together biological systems, soft matter (such as glasses and granular systems), quantum matter, nuclear physics, quantum information, quantum gravity, and string theory. This is clearly an area of inquiry in which contact between these different fields will lead to important advances, much as contact between condensed matter and particle physics did for the study of symmetry breaking (the source of multiple Nobel prizes, including this year’s and of the renormalization group. We (Brandeis Physics faculty Aparna Baskaran, Bulbul Chakraborty, Matthew Headrick, and Albion Lawrence) felt that an ideal way to promote this was to put together an intensive series of pedagogical lectures covering recent results in the aforementioned fields. With the encouragement of the National Science Foundation (due in large part to Brandeis’s IGERT program in Geometry and Dynamics we took advantage of our deep contacts with the Indian physics community to put together an Advanced Studies Institute (ASI) on thermalization, under the auspices of the new International Center for the Theoretical Sciences (ICTS) in Bangalore, and co-organized by Chandan Dasgupta (Indian Institute of Science), Gautam Mandal (TIFR, Mumbai), Sanjib Sabhapandit (Raman Research Institute and ICTS), and Krishnendu Sengupta (IACS , Kolkata). This semester, graduate students from a wide range of departments will be coming together to study quantum field theory (QFT) as part of the interdisciplinary IGERT program. QFT is a subject whose mathematical underpinnings crop up in a wide range of seemingly unrelated fields, and the study group hopes to take advantage of the varied backgrounds of its members. Mathematicians in the group can help provide mathematical rigor, while physicists can help supply the physical intuition for many of the otherwise abstruse corners of the subject. Students from other disciplines will be able to broaden the discussion by showing how some of the techniques discussed also show up in their fields. The study group will meet from noon to 1:00 every Wednesday in Goldsmith 226. All are welcome!